Rockdoc2174 wrote: In my first proper job, in the mid-seventies, when travelling to sites we had a Vauxhall lorry to take our instrumentation, large equipment and tools. The instruments tended to be fragile so it had a petrol engine, which was felt to tick over more smoothly than a diesel, so that we didn't shake anything to bits. It did no more than nine to the gallon and had a fourteen-gallon tank. Every time we filled up at a garage giving eight-fold stamps you got enough to wallpaper the bathroom yet I never did manage to collect enough to get any gift in the catalogue! In the late 60s/early70s I (with the help of my parents) collected enough Green Shield stamps to buy a complete set of golf clubs (one at a time). They were John Jacobs hollow ones (revolutionary in their day). Gave up golf about 20 years ago - gave the clubs to a local charity shop last year! This is giving the thread a tremendous bump but, after a very long time away from the route, I've been working on it again for the last few weeks. I'd become completely bogged down at Kimberley and had the equivalent of writer's block. I'm still struggling to see how to do much there in the editor - the terrain in the station area is extremely complex - but the urge to work on the route returned after Christmas. Rather than go back to banging my head on a brick wall I decided to leave it for now, move to the eastern side of Watnall tunnel and start on Nuthall, Cinderhill and the area around Bulwell North station. The last has been and still is a real challenge. There is a huge housing estate to the north and that's just a matter of planting houses but the older parts, closest to the line, must have been hell to live in. For example, literally across the road from the nurses' home at Highbury Hospital (a Gothic former workhouse that I'm trying to bodge from existing assets) was a bleaching works. Across the line from the hospital was a dye works. Next door to the bleaching works was a boys' secondary school and on the opposite side of the school was a maltings! Luckily, a lot of that can simply be a basic factory asset. The Bagnall Dye Works is a different matter. It's next to the line and the line is on an embankment so it will be visible. I'm still deciding whether to spend time trying to make it look like this or just bodge it. This is a 1928 photo from the Britain From Above website but the outlines on the mid-fifties OS maps match almost perfectly so it clearly didn't change much. The tanks on the RHS are interesting. One must be for water and the other, I guess, for chemicals. I'm sure I've seen an asset something like the nearer one but can't remember where, which is frustrating. Just to give you a taste of what I've managed so far between Basford and Bulwell this area had the Midland line to Mansfield in but there were no buildings here at Christmas. The embankment bearing off to the left was the stump of the Midland Bennerley branch that closed as a through route in WW1 but stumps remained until much, much later at both ends to serve industrial customers. Nick's laid the track on that since this was snapped. This viewpoint is the top of the GNR embankment so you can imagine how far I'm going to have to put the scenery. Can’t remember if this was shown previously ? The video is clipped from a Richard Willis DVD that's one of a pair. My wife bought them for me for my birthday last year and they're worth shelling out for. Brian's completed the Kimberley Up waiting room, complete with the wire-mesh baskets he spotted. 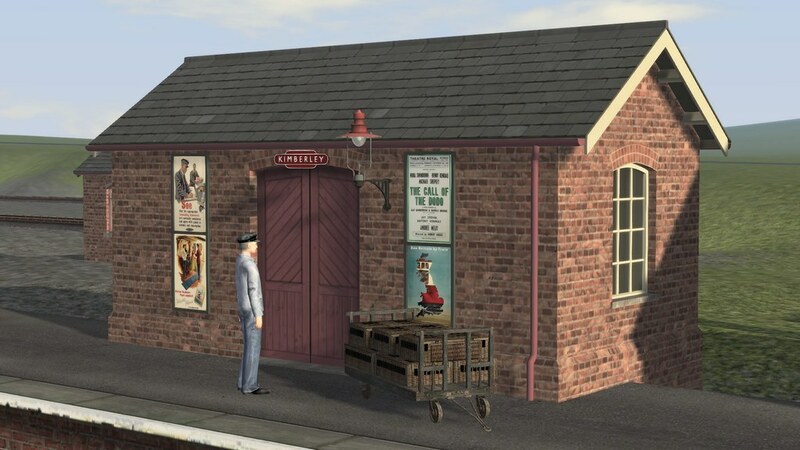 He's now working on the timber goods shed and it's looking, as usual, quite amazing in his modelling software. I'm looking forward to getting that in the game before too much longer. I haven't had a huge amount of time lately but have kept working on the area to the north of Babbington Junction, where the Bagnall Dye Works stood. The bit I'm having most "fun" with is finding a water loft that I can use for the River Leen. It ran between retaining walls through the factory - with allotments on the other side - but when it passed under the GNR viaduct is ran into marshy ground and wasn't a single stream. I may have to pass on that bit and put just the one in! Here's the latest view from Babington Junction looking approximately north-east. You can see just how much is visible and how much is left to do. I was surprised to see how much I'd done! I'm not one of those who evangelise seeing half full glasses where there are in fact half empty glasses but I see this stretch more than half full. I'm having problems getting my images to show to others at the moment, is this one visible? I have made it's privacy setting Public now. Last edited by briyeo on Mon Mar 11, 2019 3:37 pm, edited 3 times in total. I can only see images with a no entry symbol on them. I suspect it's an image link/upload/location problem.